The denunciation of Australia's history of racial prejudice was central to the Whitlam Program. Accordingly, the vestiges of the White Australia Policy were removed by the Whitlam Government, which also passed legislation to prohibit discrimination on the grounds of race. The concept of a multicultural Australian society became government policy for the first time. It also made it unlawful to incite others to discriminate in these ways. The legislation ratified Australia's adoption of the United Nation Convention on the Elimination of All Forms of Racial Discrimination. This means that the Act overrides any state or territory laws that are inconsistent with it, using the constitutional authority of the 'foreign affairs power'. 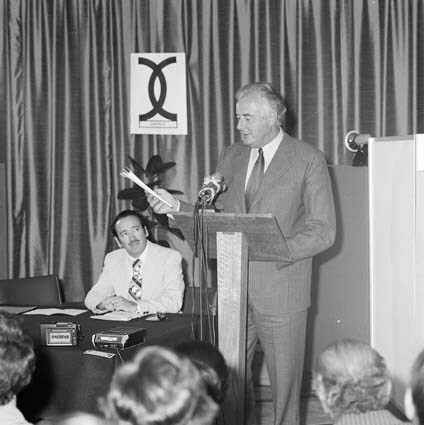 At his speech proclaiming the Act, Whitlam said that 'by this act we shall be doing our best to redress past injustice and build a more just and tolerant future'. The constitutionality of the Racial Discrimination Act was challenged in the High Court by the Queensland Bjelke-Petersen Government, but the court upheld the validity of the legislation. The Whitlam Government also attempted to establish a more complete framework by introducing the Human Rights Bill, which would have given force to Australia's ratification of the International Covenant on Civil and Political Rights 1966. Although many aspects of the White Australia Policy had been removed in the years prior to the election of the Whitlam Government, discriminatory measures in immigration remained. Certain privileges and advantages were given to white or British migrants, and denied to others. The Whitlam Government acted to remove this discrimination. Before the election of the Whitlam Government, the Assisted Passage Migration Scheme, which provided financial assistance to new migrants, discriminated against immigrants on the basis of their ethnicity. The Whitlam Government extended the scheme to include immigrants of any ethnicity. Eligibility for citizenship was made more equitable. Before the Whitlam Government passed the Australian Citizenship Act 1973, migrants from non-Commonwealth nations had to reside in Australia for five years before they were eligible for citizenship, whereas Commonwealth migrants could qualify after one year of residing in Australia. The Whitlam Government's legislation meant that all immigrants, regardless of their origin, were eligible after three years' residence in Australia. Multicultural radio stations and telephone translation services were introduced to provide improved support for new migrants once they arrived in Australia. The Whitlam Government also provided additional educational support for migrant children, with additional teachers, learning spaces, and specialised classes for new migrants at school. Migrant education centres were established in most state capitals and multilingual welfare officers were employed to assist migrants to access social services. The Whitlam Government was responsible for the introduction of the official policy of multiculturalism, whereby government policies would encourage the notion that cultural differences within society should be accepted and celebrated. The first expressions of this policy were the introduction of new translation services for migrants, the establishment of multicultural radio services, and the incorporation of multiculturalism into health, welfare and education policy. Immigration Minister Al Grassby was an enthusiastic advocate of the principles of multiculturalism, passionately arguing for the benefits of cultural diversity and the importance of social harmony and tolerance.